It is rare that any service hears from 800,000 of its users at the same time, but that is what happened recently with the publication of the GP Patient Survey. It is easy to dismiss this kind of survey, particularly when the results make difficult reading – the questions are wrong, it doesn’t reflect the right patients – but when this number of people have taken the time to give their views on the services they receive then we should take the time to listen to what they are telling us. What they are saying will be giving cause for concern for national policy-makers. For the past five years the scores for many measures have dropped year on year, albeit often from a relatively high baseline. Some drops are larger than others, but overall there is a decline in patients’ experience of GP services. The percentage of patients who rate their overall experience as good has dropped from 88.4 per cent in June 2012 to 84.8 per cent in July 2017. The sheer size of the sample means that even one percentage point change is meaningful at a national level – a decline on this scale needs attention. 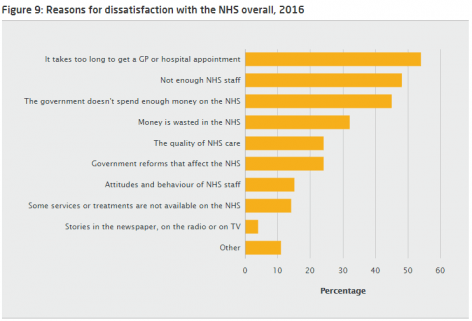 There is relatively little change in satisfaction with the care people received at their last appointment – eg, being given enough time, being listened to and having confidence and trust in the doctor or nurse. The care once people are in the practice does not seem to be the issue; it is getting in that is increasingly a problem. This partly explains the emphasis successive governments have placed on improving access over the past few years. The key question on access in the GP patient survey asks: ‘Overall, how would you describe your experience of making an appointment?’. In June 2012, 79.3 per cent rated their overall experience as good; in July 2017, this was down to 72.7 per cent. Perhaps more worrying is the variation across CCGs. The difference between the best and worst performing CCGs on this question is almost 30 per cent. Patients are also finding it harder to get through to their GP surgery on the phone – a drop from 77.9 per cent finding it easy in 2012 to 68 per cent in 2017. This drop might be less concerning if significantly more people were using online services, but this is not the case. NHS England and the BMA have encouraged practices to register a minimum of 10 per cent of their patients for at least one online service by 31 March 2017, and the figures suggest this has been achieved. 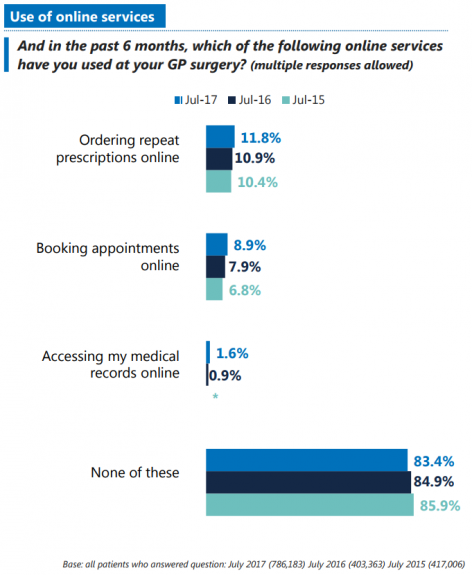 However, if digital access is to stand any chance of moderating intense demands on GPs, more will need to be done both to promote the use of online services to patients and to ensure those services provide clear benefits. Why is access getting worse? As part of its focus on seven-day services, the government has invested heavily in improving access to GP services. In addition to extending opening hours in the evenings and at weekends, there has been investment in new approaches such as telephone and online triage. So why are people’s experiences of access getting worse? There may be a number of reasons, and more work needs to be conducted on the ground with GPs and patients to find out what is happening – but starting with supply and demand seems to provide some answers. As we found in our study published last year, GPs are under increasing pressure because of both the volume and intensity of their workload. We identified a 15 per cent increase in the number of consultations between 2010/11 and 2014/15. There was also a 28 per cent increase in the number of consultations with people over the age of 85, who are more likely to have multiple health conditions. Furthermore, despite a government pledge to increase the number of GPs by 5,000 by 2020/21, the number actually fell by 0.3 per cent in 2016. Fewer GPs are doing full-time clinical work in general practice, and large numbers are leaving the profession. The initiatives have mainly focused on extending the hours that practices are open, but if the overall number of GPs is not increasing it’s hardly surprising that just asking them to spread their time over more hours isn’t really helping. There is, of course, no easy solution – even increasing the number of GPs through international recruitment is unlikely to be enough. 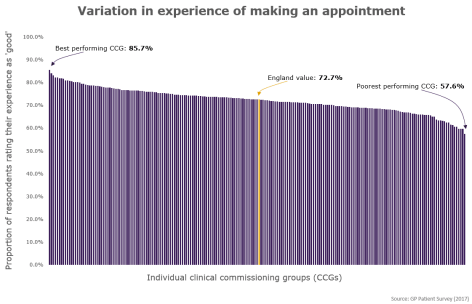 There is clearly variation in access across the country that can be addressed, and CCGs may wish to invest in helping practices become more efficient in understanding and managing patient flow. However, the longer-term solutions are likely to be more complex and involve examining all the ways in which general practice might deliver urgent and long-term care to patients. It is worth remembering that behind the graphs and statistics lie 800,000 patient stories. We need the numbers, but we also need the qualitative data and insight. Only by understanding what some of these stories are telling us can we truly design services and solutions that are patient centred.